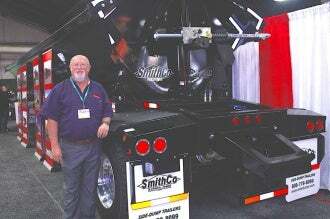 SmithCo attended this year’s Mid-America Trucking (MATS) show on 26 – 28 March. MATS is the largest, annual, heavy-duty trucking industry event in the world. Held each year at the Kentucky Expo Center in Louisville, Kentucky, the show attracts moe than 70,000 attendees and over 1,000 exhibitors from throughout the US and abroad. No other show offers more under one roof than the annual Mid-America Trucking Show. SmithCo’s national sales manager Rick Lawrence and was at the expo to meet participants. Image: SmithCo’s Rick Lawrence at MATS. Photo: courtesy of SmithCo.